Even though, the industrial revolution has lead to highly advanced lifestyle, it has also taken a toll on our natural environment. The fault is not with the technology but with the assumption that the environmental resources are free and unlimited. With this assumption, the market decision making that is carried out will lead to both environmental damage and repid resource depletion. But now humanity is beginning to realise that natural resource including clean air and water are scarce resources. Once scarcity is accepted, then the technology that will be developed will take this into consideration and we will end up with the appropriate technology that minimises waste generation. But, because there is a trade-off between economic growth and environmental quality we cannot expect to have perfectly clean air and perfectly clean water with continuous growth of an economy. The objective of growth in an economy should be to reduce the human induced(anthropogenic) waste to a level that is 'acceptable' to society, because it is scientifically impossible to completely eliminate the generation of anthropogenic waste. Also there is a need to balance growth with resource preservation so that the needs of the future generation will be balanced with those of the present generation. Waste reduction is consistent with the principle of sustainable development. The paper deals only with the disposal of non- hazardous solid waste. There are two basic problems with the disposal of non-hazardous solid waste or more commonly known as municipal solid waste. The first is the fact that the opportunity cost of land used as land fill is not very low and is rising. This will make land fillings more costly than other disposal options that may be available. The second problem is the NYMBY syndrome (not in my back yard). That is, the problem of 'not having the land fill in my backyard syndrome'. Even if the opportunity cost of land fill is small, this NYMBY syndrome will make using of land fills to dispose the waste, and unattractive option and will lead to increasing transportation cost. The paper aims in identifying various mixes of economic policy instruments that may be available to dispose municipal waste. The paper then will try to illustrate how using a mix of policy instruments, rather than using single instruments might bring about efficiency in waste minimisation to a level that is 'acceptable' to the society by bringing about reduction at source, reuse, and recycling. Even though, the Industrial revolution has lead to the highly advanced lifestyle that the society is now able to enjoy, it has also taken a toll on our natural environment. The fault is not with the technology that we had been adopting, but with the assumption that the environmental resources are free and unlimited. As such the technologies that were development also treated the environment as a free good. A free good by definition is when the quantity supplied at any time exceeds the quantity demanded at zero prices. That is the good does not command a positive price at any time in the market economy. What is implied here is that the natural resources are not scarce. But now humanity is beginning to realise that natural resource including clean air and clean water are scarce resources. The assumption of scarcity is valid because people are willing to pay a positive price for these natural resources that were earlier thought to be in abundant supply. Even though, we do not observe positive prices for some of the environmental resources because there are no markets for some of the environmental resources, they still have positive economic values, because people are willing to pay positive prices for these resources. Once scarcity is accepted then the technology that will be developed will take this into consideration and we will end up with the appropriate technology. The reason for the scarcity of the natural environment, as the growth of an economy takes place, is due to the fact that during production and or consumption stages in the economy waste is generated. This waste is human induced and is referred to as anthropogenic pollutants. This is different to natural pollutants, which is brought about through natural processes in nature, such as volcanic eruptions, decay of plants and animals etc. This anthropogenic waste reduces the quality of the natural resource, even though the quantity of the natural resource may remain the same. That is, there is a trade-off between economic growth and environmental quality (Sathiendrakumar, 1996). In other words we cannot expect to have perfectly clean air and or perfectly clean water with continuous growth in an economy. The first two laws of thermodynamics support this claim.. Furthermore, the second law of thermodynamics, known as the law of entropy, shows that the nature's capacity to convert matter or energy is bounded. The law of entropy states that for all processes entropy increases. Entropy is the amount of energy that becomes unusable or the amount of wasteor useless energy. Material enters the production process with low entropy (high useable energy) and leaves the production process with high entropy (low useable energy). This law rules out the possibility of 100 percent recycling of any waste (Turner et al., 1994). Thus the second law of thermodynamics shows that waste will always be generated with growth in an economy in the long run. Here the field of science is used to understand the material balance, which also shows that it is impossible to have a quality environment that is not scarce, when we have growth in the economy. It may not be possible to do anything about natural pollutants. But the objective of growth in an economy should be to reduce the anthropogenic waste to a level that is 'acceptable' to society, because it is scientifically impossible to completely eliminate the generation of anthropogenic waste. Also we have to learn to balance growth with resource preservation, so that the needs of the future generation will be balanced with those of the present generation. Sustainable development is not a question of stopping industrial or agricultural activities to preserve the environment because it is not possible to have an economic activity without having an impact on the environment. Furthermore, there are clear indications that environmental degradation can actually impede economic development and that improved environmental management can form the basis of long term development strategies. Therefore, the aim of sustainable development should be to see that the environmental costs to future generations from current development activities should not outweigh the economic benefits to current generation from economic growth. Sustainable development is defined as 'development that meets the needs of the present generation without compromising the ability of the future generation to meet their own needs" (WCED, 1987, p.43). This definition is closely related to the concept of inter-gnerational equity. 2. THE ECONOMIC REASONS FOR REDUCING THE AMOUNT OF ANTHROPOGENIC POLLUTANTS. Government intervention in waste management is called for due to market failure. Here market failure occurs because there is no property rights over the environment. The underlying source of all environmental problems is the absence of property rights. That is, the market fails when the environment is held as a common property or when it is not owned at all (Pearce and Turner, 1990). Property rights implies a set of valid claims to the environment that permits the use of the environment by the owner of the person who holds the rights, and to transfer their claims on ownership through a voluntary exchange (sale). When well-defined property rights are exchanged in a market economy, that exchange itself facilitates efficiency. Furthermore, these rights should be protected from involuntary takeover or encroachment by others (Tietenberg, 1992). It is very difficult to give pure property rights, even though it may be possible to give quasi property rights. The question of quasi property rights will be discussed later in this paper. This lack of property rights results in zero market prices for the environment and in turn leads to the externality problem. This zero market price for the environment and the resulting externality does not allow the amount of waste generated in an economy to be socially optimal, but leads to an over supply of waste in the economy. Market failure occurs because at the private market equilibrium, the marginal net social benefit is negative. Social benefit is defined as "the contribution that an activity makes to the society's welfare'. Social benefit includes both the private benefit to the consumer in consuming that commodity plus any external benefit that may accrue to any other member of the society when that commodity is produced or consumed (known as the external benefit). Social cost on the other hand is defined as 'the value of the best alternative use of resources available to society as valued by the society'. The social cost includes both the private costs (the value of the best alternative use of resources used in the production as valued by the producer) as well as theexternal cost (the cost bourn by the third party). 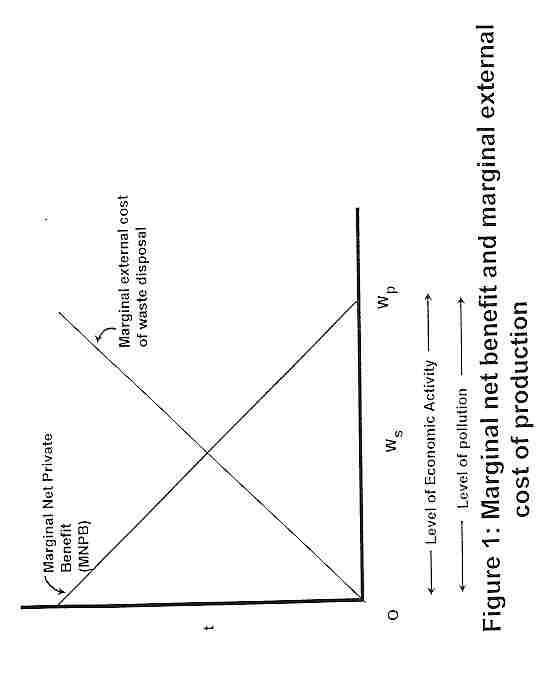 Marginal net social benefit is the marginal social benefit less the marginal social cost. Marginal social benefit is the value of the benefit from one additional unit of consumption, including the benefit to the buyer (marginal private benefit) and any indirect benefits accruing to any other member of society (marginal external benefit). Marginal social cost on the other hand is the cost of producing an additional unit of output, including the cost bourn by the producer (marginal private cost) and any other costs incurred by any other member of the society (marginal external cost). This implies that at market equilibrium, even though at the margin the private benefit is equal to the private cost, the social cost exceeds the social benefit. In Figure 1, Wp is the market equilibrium for waste generation, that is where the marginal net private benefit is zero. But the economically efficient or the socially optimal level of waste generation is when at the margin the net private benefit is equal to the external cost created by the disposal of solid waste, which is denoted by Ws. This external cost is created by the damage that is brought about to the society by the waste product that is disposed onto the environment after the production and/or the consumption of the good. In economics, environmental problems are modelled, either using the theory of public goods or the theory of externalities. If the market is defined as 'environmental quality' then the cause of market failure is due to the public good nature of the environment. Public good is defined as 'any good or service that, if they provide benefits to anyone, can, at little or no additional cost, provide benefits to a large group of people'. That is, it is a commodity that is non-rival in consumption and yield benefits that are non-excludable. On the other hand, if the market is defined in terms of goods whose production and or consumption leads to some environmental damage, then the market failure is due to the presence of an externality. An externality is defined as 'effects, either good or bad, on parties not directly involved in the production or use of a commodity, known as the third party'. Therefore we have to look at policies that deal with the public good aspect of the environment and the policies that deal in correcting a cost externality. Because the paper is dealing with non-hazardous solid waste, namely the municipal solid waste, the paper will not consider this aspect, which is more relevant for other types of waste such as gaseous waste, where the market may be defined as 'environmental quality'. 'Environment quality' is a public good. 2.2	Polices that deal in correcting the externality problem from the disposal of waste. In Australia, MSW service is charged a fixed fee or a flate fee and is included in the municipal rates that are paid by each householder. This fee is the same in a given municipality regardless of the quantity of waste generated by the households in that municipality and the price does not reflect the rising marginal cost of waste disposal. Efficiency implies that price should be set equal to the marginal cost. That is the price charged for MSW services should be in relation to the marginal cost of waste disposal to the service provider. Therefore, the price charged for MSW services should rise with the amount of waste generated. That is, the price charge should be equal to the marginal private cost for the MSW service provider in disposing that waste. Therefore, there is no incentive for waste generators to reduce their waste with the current system of flate fee that is charged by the municipality for the disposal of house holds waste. Even if we have a market for municipal solid waste services and if the prices for that service is based on the marginal private cost, there will still be an over supply of waste over and above the socially optimal level. This is because there may be some externalities from waste disposal services. Examples of such externalities are fround water contamination from waste disposal or air pollution from incineration of waste or even destruction of aesthetic beauty of the environment where waste is dumped. Ground water contamination may even create an intergenerational problem. In theory, this externality created by waste generation can be achieved by a Pigovian tax on waste. In Figure 1, this is equal to $1 per unit of waste generated. Such a per unit tax will shift the marginal net private benefit (MNPB) to the left, such that the MNPB will be equal to zero at the socially optimal level of waste production, which is at Ws. Therefore, it could be argued that pollution taxes are efficient in that they have in built optimality property. These are instruments that will affect the pricing of the product that generates the solid waste. Therefore, they will bring about changes in consumer choice between substitutes in a competitive market economy. For example, product levies, such as a packaging tax on material used for packaging, which increases the price of the product, will lead to a reduction in packaging material per unit of volume or per unit of weight packed. Similarly goods containing recycled materials might attract a lower product levy than goods that are similar but do not incorporate these recycled materials. Such levies would alter the behaviour of both the producers and the consumers and in turn will force them, indirectly, to take account of the environmental impact of waste disposal. Here the consumer pays a levy when he/she purchases the product and receives a refund when the consumer returns the container of the product (Bohm, 1981; Porter, 1978). An example of this is the deposit you pay for a bottle on the purchases of a bottled drink and the refund that you receive when that bottle is returned to the place of purchase. The purpose of this deposit is to encourage people to return the container, which could be reused or recycled by the manufacturer, rather than disposing it as garbage. Such a policy instrument will help in reducing the societies total cost of disposal of material by encouraging the reuse or recycling of material. The demand curve for this municpal solid waste is the marginal private benefit that all these service providers get when they dispose the municipal solid waste generated by all the households in that area. In other words, this shows how the quantity demanded of this municipal solid waste services by the waste generators respond to the price charged by the service providers. This demand curve will shift to the right if the income of the community rises, holding everything else constant (ceteris paribus assumption). Likewise if the generators of this waste become more environmentally conscious or when there are appropriate policy instruments in place that treats the environment as a composite asset and not as a free good, then the market demand curve will shift to the left, ceteris paribus. Treating the environment as an asset helps the society to minimise the undue depreciation of that asset. Because of the impossibility in giving pure property rights to the environment, we have to consider the question of providing quasi property rights to the environment. Therefore such policy instruments that encourage the three 'R' principles, namely reduce, reuse and recycle help in providing some form of quasi property rights to the environment. · The opportunity cost (a reasonable return for the entrepreneur for the above three services provided). · The principle of economic efficiency. That is, it should provide a least cost solution that is able to mitigate the range of pollution and resource usage impact associated with packaging, including the administrative and compliance costs. Also the policy instrument should provide a continuous incentive for seeking least-cost solution. · The principle of equity. The is, the policy should not confer disproportionate burden on the least well off in the society. That is, the impact of the instrument should not be significantly regressive. · The principle of acceptabillity. That is, the policy should be easily internalised by the existing market and institutional system and should be transparent. Also the instrument should be compatible with the national, regional recycling objectives and existing legislation. The latter is known as institutional concordance. We could represent the above three criteria as a 'cubic' model. 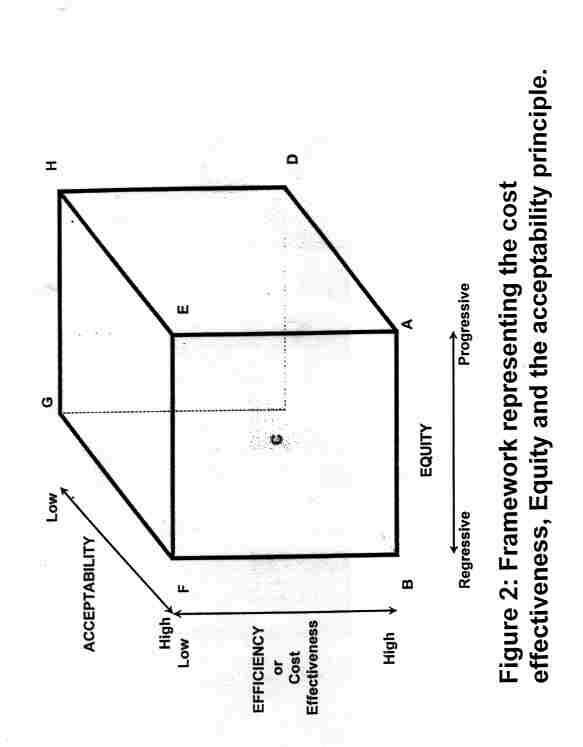 The framework in Figure 2 is in the form of a cube whose surfaces represent the efficiency, equity and acceptability principles. The eight corners of the cube are labelled as 'A', 'B', 'C', 'D', 'E', 'F', 'G', and 'H'. The positions 'A', 'B', 'C', and 'D' are the ones that satisfy the efficiency principle (or cost effectiveness principle). Likewise, the corners 'E', 'F', 'A' and 'B' are the ones that satisfy the acceptability principle. The corners 'A', 'D', 'E' and 'H' are the ones that satisfy the equity principle. Therefore the policy instrument that satisfies all three principles is position 'A'. The position that satisfies at least two of these principles are corners 'E', 'D', and 'B'. Therefore, we could use the above framework to select the appropriate policy instrument that could be used to satisfy the principles that we aim to achieve, namely, efficiency, equity and acceptability. 4. ECONOMIC POLICIES TO ACHIEVE SUSTAINABLE DEVELOPMENT (BALANCE THE NEEDS OF FUTURE GENERATIONS WITH THE CURRENT GENERATION). The above policy instruments seeks to modify human behaviour through the price mechanism, thereby correcting for market failure aspect of the environment. In addition to modifying the human behaviour, these instruments could also be used to raise finances necessary to facilitate the collection, processing and storage of waste. This is an input tax on the material used in the manufacture of packaging. This is aimed at source reduction. Also such levies could be used to raise finance necessary for collection, storage and disposal of waste. The material levy will raise the price to the consumer and therefore will be a purchase relevant instrument. Such levies will not only help in reducing the material used in packing but also in relative term's help in using material which is less damaging to the environment. Especially if the size of the levy is related to the environmental damage created by the packaging material during both production and consumption of the material. But such an instrument by itself may not encourage the participation of the consumers in recycling of the packaging material, as it is only a purchase relevant and not a discard relevant instrument. Also the poor in our society spend more, as a proportion of their income on consumption of food than the rich do. Therefore such material levy on food packaging may be more regressive. Product charge by itself is an out put tax and will be charged on the packaged end product itself. This is a purchase relevant instrument as it raises the price of the packed material to the consumr. But it could be made into a jointly relevant instrument if the policy is to reimburse part of the charge on the packaging component, if the consumer returns his/her packaging material to a recycling centre. Part of the packaging cost is only refunded in order to take into account the administrative cost involved in collecting and transporting the packaging material. When the policy instrument is jointly relevant as in the above case it will not only satisfy the economic criterion but also the criteria of equity and acceptability principles in waste management. As the name indicates, by itself it is a discard relevant instrument. If this instrument is deployed only to raise finances for collection and disposal of waste as in many municipalities it will not help in changing the behaviour of people that is aimed at cutting down on their waste generation. But if the waste disposal charge on the consumer is based on the weight of refuse rather than a flat charge, then it will help in changing the behaviour of people towards minimisation of waste generation. It helps in waste minimisation by encouraging increased reuse and/or recycling of some of the material that may be discarded if waste disposal charge is a flat rate. Such an instrument will not only be more efficient in terms of waste minimisation but also be more equitable and more acceptable. Economic growth and environmental quality are inextricably linked. But if environmental degradation is pushed too far in order to achieve economic growth at all cost, then such environment degradation will make that economic growth unsustainable. This is because the society continues to ignore the market failure aspect when dealing with the disposal of waste on to the environment. But the welfare gains from income growth by the present generation may be outwighed by the losses from environmental damage created by waste disposal on the future generation. With the opportunity cost of land rising and with the NIMBY (not in my back yard) syndrome, findig suitable land to dump municipal waste may become a major problem. Therefore, an instrument such as product charge linked to a refund scheme and/or a quantity-related waste disposal charge linked to a deposit refund scheme may help in changing the behaviour of both producers and consumers towards minimising the discharge of waste on to the environment. Furthermore, when land becomes much scarcer for use as dump for waste disposal, it may be necessary to divide the waste ito combustible and non-combustible waste. The energy released from the combustible waste may be used in supplying the electricty grid. Therefore valuing the environment, considering the true costs of resource depletion and ensuring that these costs are incorporated into the decision making process is an important factor in ensuring that economic growth and environmental management remain mutually inclusive goals for any country's sustainable economic development. Bohm, P. (1981), Deposit Refund Systems: The theory and Applications to Environmental Conservation and Consumer Policy, John Hopkins University Press, Baltimore, USA. Fenton, R. and N. Hanley (1995), "Economic instruments and waste minimisation: the need for discard-relevant and purchase-relevant instrument", Environment and Planning, Vol. 27, pp1317 - 1328. Hong, S., R. Adams, and A. Love (1993), "An economic analysis of household recycling of solid wastes: the case of Portland Oregon", Journal of Environmental Economics and Management, Vol. 25, pp. 136 - 146. Pearce, D.W. and R.K. Turner (1990), Economics of Natural Resources and the Environment, Harvester Wheatsheaf, Hertfordshire, UK. Porter, R. C. (1978), "Beverage container deposits", Journal of Environmental Economics and Management, Vol. 5, pp. 351 - 375. Sathiendrakumar, R. (1996), "Sustainable development: passing fad or potential reality", International Journal of Social Economics, Vol. 23 23 (4/5/6), pp. 151 163. Turner, R. K., D. Pearce, and I. Bateman (1994), Environmental Economics: An Elementary Introduction, Harvester Wheasheaf, Hertfordshire, UK. Tietenberg, T. (1992), Environmental and Natural Resource Economics, 3rd Edition, Harper Collins Publishers, New York. World Commission on Environment and Development (WCED) (1987), Our Common Future, Oxford University Press, Oxford and New York.